Corn and soybean returns for high-productivity farms in central Illinois are projected for 2018 and 2019. Corn and soybean prices have declined in recent months, with trade disputes impacting those declines. Moreover, non-land costs are projected to increase in 2019. As a result, returns for 2019 are projected at low levels, likely requiring large downward adjustments in cash rental rates on farmland. Cash flow and financial planning for 2019 could be difficult. Table 1 shows corn budgets grown on high-productivity farmland in central Illinois. Actual results for 2012 through 2017 are summaries from grain farms enrolled in Illinois Farm Business Farm Management (FBFM). Projections are made for 2018 and 2019. For 2018, a 215 bushel per acre yield and a $3.70 corn price are used in projections. Growing conditions over much of central Illinois seem favorable and the 215 bushels per acre yield projection is above trend. Using exceptional yields like the 2017 yield of 228 bushels per acre and the 2018 yield of 227 bushels per acre seem premature at this point. Yields will come into much clearer focus soon. The $3.70 price is near current fall delivery bids. A 215 bushel yield and $3.70 price results in $796 of crop revenue. That Agricultural Risk Coverage (ARC) and Price Loss Coverage (PLC) commodity title programs are not expected to make payments on 2018 crop. Budgets for 2018 include $20 per acre of other government payments, representing a payment from the Market Facilitation Program, a program announced by the Trump administration to aid farmers in adjusting to lower prices from trade disruptions (see USDA press release). Few details have been released on the program; therefore, the $20 per acre is a preliminary estimate. If a $20 payment occurred on all of the 170.5 million corn and soybean acres projected to harvested in the U.S., the total government outlay on corn and soybeans would be near $3.4 billion, well below the $12 billion allocated for trade disruption programs. Larger payments are possible. Conservatism was used in projecting these payments. The same $20 per acre value will be used for soybeans. Total non-land costs in 2018 are projected at $563 per acre, yielding $253 of operator and land return. Operator and land return is the amount to that can be split between farmer and landowner. Budgets include land costs equal to the average cash rent for this high-productivity farmland. Subtracting this $264 cash rent gives a -$12 farmer return on cash rented farmland. While negative, the -$12 projected return for 2018 is higher than the -$57 return in 2017. The 2018 corn price of $3.80 is projected higher than the $3.40 price for 2017. The $20 projected Market Facilitation Program payment also contributes to higher returns. For 2019, a 207 bushel per acre yield is used in projections, the trend yield for central Illinois. This trend yield is below recent yields, but is near the trend yield. Counting on continued high yields seems imprudent. A $3.80 price is used in projections, giving $787 per acre of crop revenue. No other revenue is projected. Non-land costs are projected to rise from $563 per acre in 2018 to $586 per acre in 2019. Energy costs have been rising, leading to cost increases in fertilizer, drying, and fuel. The major increase comes from fertilizer, increasing from $130 per acre to $145 per acre. Operator and land returns are projected at $201 per acre in 2019. Any cash rent above $201 per acre would lead to negative returns to farmers. 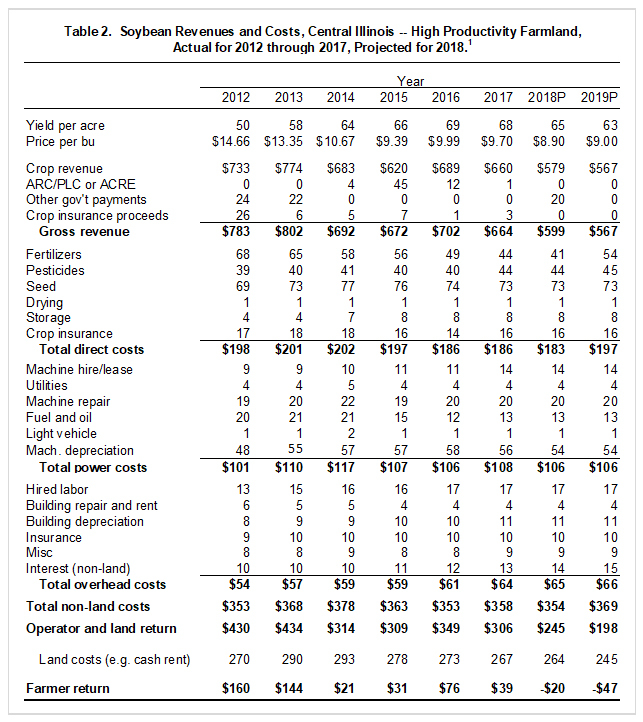 Table 2 shows revenues and costs for soybeans. For 2018, a 65 bushel per acre yield is used in projections. Again, more information on yields will be known soon. An $8.90 soybean price is used in projections, above fall delivery bid prices. As noted in an earlier farmdoc daily article (July 10, 2018), the amount of pre-harvest hedging of soybeans will have a large impact on revenue. Crop revenue is projected at $579 per acre. No ARC or PLC payment is included in revenue projections. A $20 per acre Market Facilitation Program payment is included in the budget. Gross revenue then is $599 per acre. Total non-land costs in 2018 are projected at $354 per acre. Operator and land return than are $245 per acre. An average cash rent of $264 is above operator and land return, leading to a -$20 loss to the farmer. If 2018 budgets hold, farmers will be projected to have losses on soybeans. This differs from the earlier years shown in Table 2 and the -20 return in 2018 is $58 lower than the 2017 return. The switch in soybeans from profitability to unprofitability does not bode well for farmer incomes. For 2019, a 63 bushel per acre yield and $9.00 per bushel price are used in projections, giving $567 of crop revenue. No other revenues are projected, giving a gross revenue projection of $567 per acre. Non-land costs for 2019 are projected at $369 per acre, an increase of $15 per acre over 2018 costs. The $567 of gross revenue less the $369 of non-land costs result in $198 of operator and land return. Any cash rent over $198 will cause negative returns to the farmer. Lower prices and higher costs cause lower farmer returns, leading soybean production to be projected unprofitable. A $20 per acre Market Loss Facilitation payment is not projected to cause profitability for either corn or soybeans in 2018. There still may be some optimism that 2018 incomes may be better than implied by the above budgets. Many farmers likely had marketing gains on crop produced in 2017 and sold in 2018. Forward sales of soybean and corn could blunt some of the recent price declines (see farmdoc daily, July 10, 2018). Yields above those shown in 2018 budgets are quite possible. And Market Loss Facilitation payments could be larger than expected. Still, 2018 incomes could be low. The outlook for 2019 simply is not good at this point. Soybean prices have declined from near $10 per bushel in 2014 through 2017 to projections to near $9.00 for 2018 (see Table 2). This price decline causes soybeans to go from profitability to unprofitability. This price decline is combined with projections of rising non-land costs, further leading to lower returns. 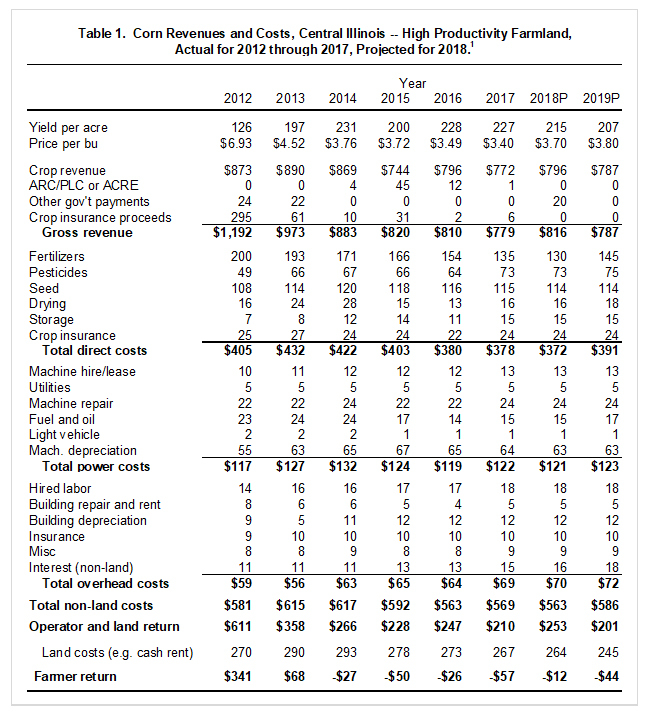 For 2019, operator and land returns are projected at $201 per acre for corn and $198 per acre for soybeans, for an average of $200 per acre. Any cash rent over $200 per acre will result in losses to farmers. A $200 operator and land return is over $60 lower than average cash rent levels in 2018. Serious discussion of lowering cash rents will need to occur this fall. When those negotiations are conducted, farmers and landowners will need to ask if prices beyond 2019 will continue to be near $3.80 for corn and $9.00 for soybeans (see farmdoc daily, August 2, 2018,). If so, the returns like those projected for 2019 could be in store for several years after 2019. Perhaps some series of event will change the 2018 and 2019 outlook. Exceptional yields in 2018 and 2019 like those in 2016 and 2017 would help, but there is no guarantee of that occurring. An end to trade disruptions also could lead to higher prices, but there is no guarantee of that occurring either. A season of serious difficulties in 2019 financial planning looks in store for farmers, lenders, and others in agriculture. Note: A full version of 2019 budgets will be released the week of August 13. A note will be made here and on farmdoc when they are released. Schnitkey, G. and C. Zulauf. "Setting 2019 Cash Rents with Price Uncertainty due to Trade Disputes." farmdoc daily (8):143,Department of Agricultural and Consumer Economics, University of Illinois at Urbana-Champaign, August 2, 2018.